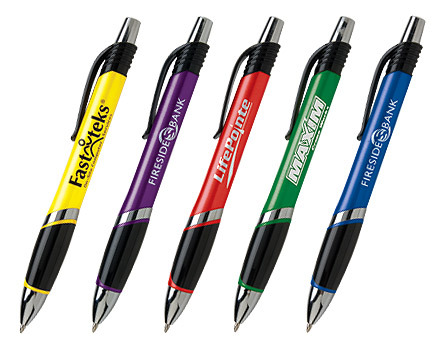 Exciting and Colorful Retractable, Sleek Black Plastic Grip. Blue Writing ink. Imprint Area is: 1 1/2" x 5/8"
250 1 color(s) imprint at $217 ONLY $0.87 each. 500 1 color(s) imprint at $288 ONLY $0.58 each. 1000 1 color(s) imprint at $431 ONLY $0.43 each. 2500 1 color(s) imprint at $910 ONLY $0.36 each. 5000 1 color(s) imprint at $1,732 ONLY $0.35 each. 10000 1 color(s) imprint at $3,450 ONLY $0.35 each. 15000 1 color(s) imprint at $4,952 ONLY $0.33 each. 23000 1 color(s) imprint at $7,585 ONLY $0.33 each.